Planting asparagus requires a little bit more effort compared with other vegetables. The soil in the garden needs to be light and airy. A good tilling to a depth of 10-12 inches is needed. Asparagus is generally grown in rows. The plants are spaced 18 inches apart in rows 5 feet apart. They are generally planted in April or May, after all danger of frost has passed. 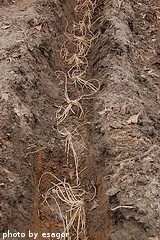 Most folks plant asparagus crowns, or root systems, because they are easier to get started. Some people begin with seed. If you choose to start planting asparagus with seed, just know that it will require a lot more time and effort. If you start with crowns, you can expect your first harvest to occur a year after planting. If you start with seeds, it will take 2-3 years before your asparagus will be ready to harvest. Asparagus seeds take approximately 3 weeks to germinate. If you start with seeds, plant them 1/4 inch deep in flats filled with potting soil. Begin this process approximately 12 weeks before you plan to transplant them into your garden. Place the flats in a warm, sunny, indoor location and make sure the soil stays moist. They can be transplanted into your garden after all danger of frost has passed in your geographic area. Asparagus crowns can be purchased at most garden centers. Crowns are basically asparagus root systems that are at least 1 year old. After being established, a mature crown will produce approximately 1/2-1 pound of asparagus every year. To plant the crowns or seedlings in your garden, dig a trench 8 inches deep and 8 inches wide at the bottom. Sprinkle a phosphate rich fertilizer, such as 10-20-10, in the bottom of the trench. Cover the fertilizer with an inch of soil. Place the crowns or seedlings in the trench and spread out the roots. Cover with 3 inches of soil and water thoroughly. When the shoots emerge and are 6 inches tall, add more dirt to the trench to bring the soil back to level with the rest of the garden. Do not cover up the shoots. 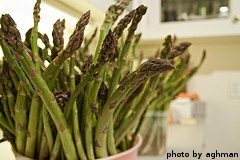 Do not harvest any asparagus during the year you first planted it. Let the shoots grow and get long. They will eventually produce ferns. These ferns use photosynthesis to produce food for the plant that will be used the following year to produce edible spears that can be harvested. Now that you've finished planting asparagus, it's time to learn about fertilizing, watering and harvesting your crop.